Brendan Byrne, S.J. Luke portrays the life and ministry of Jesus as a divine "visitation" to the world, seeking hospitality. The One who comes as visitor and guest becomes host and offers a hospitality in which the entire world can become truly human, be at home, and know salvation in the depths of their hearts. In The Hospitality of God Brendan Byrne, S.J., provides to-the-point commentary on those parts of Luke's Gospel that bring home to people a sense of the extravagance of God's love for them. The Hospitality of God approaches Luke's Gospel through the interpretive key of "hospitality." It looks at the Gospel as a whole, yet lingers upon scenes where the theme of "hospitality" is particularly prominent, such as the infancy stories, Jesus at Nazareth, Jesus in the house of Simon, the Good Samaritan, Martha and Mary, the banquet in 14:1-35, the Prodigal Son, Jesus' visit to the tax collector Zacchaeus, the institution of the Eucharist, and the Emmaus event. 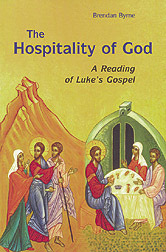 Byrne stresses that those in Luke's Gospel who readily offer hospitality—chiefly the marginalized and the poor—find themselves drawn into a much deeper sphere of hospitality, the hospitality of God. Those who have difficulty sharing are challenged by Jesus to conversion so that they, too, may not be left out of the banquet of life to which God calls all human beings. Luke's Gospel, ever interested in the process of human transformation, explores this resistance to God's gift and the ways in which individuals need to be converted if they are to come to "knowledge of salvation." Luke's Gospel is written out of faith in the risen Lord. Its primary intent is to bring people of all subsequent Christian generations into saving encounter with the Lord who was raised from the dead and lives among us in the power of the Spirit. Reading and hearing the Gospel in faith allows individuals and communities to access the hospitality of God brought by Jesus. In this work, Byrne offers an invitation for all to join in the life-giving "hospitality of God." Chapters are "The Prologue: 1:1-4 and the Lukan Time Frame of Salvation," "The Infancy Stories I: Before the Birth of Jesus: 1:5-80," "The Infancy Stories II: The Birth and Childhood of Jesus: 2:1-52," "Prelude to the Ministry of Jesus: 3:1-4:13," "Hospitality and Inhospitality at Nazareth: Jesus Inaugurates His Mission: 4:16-30," "The Early Galilean Ministry: 4:31-6:11," "The Community of the Kingdom: 6:12-49," "Response to the Ministry of Jesus: 7:1-8:3," "Later Galilean Ministry: 8:4-9:17," "Climax of the Galilean Ministry: 9:18-50," "The Journey to Jerusalem Begins: 9:51-10:24," "The Way to Eternal Life: 10:25-11:13," "The Prophet Continues His Way I: 11:14-12:53," "The Prophet Continues His Way II: 12:54-14:35," "Celebrating God's Acceptance: 15:1-32," "The Hospitality of the Poor: Two Responses to Wealth: 16:1-31," "Towards the End of the Journey: 17:1-18:30," "Hospitality in Jericho: 18:31-19:27," "Jesus in Jerusalem: 19:28-21:4," "Hope and Endurance: Discourse on the Future: 21:5-38," "Jesus' Journey to God: The Passion Narrative I: 22:1-53," "Jesus' Journey to God: The Passion Narrative II: 22:54-23:56," "Hospitality Continues: The Community of the Risen Lord: 24:1-53." Brendan Byrne, S.J., is professor of New Testament at Jesuit Theological College, within the United Faculty of Theology, Parkville, Melbourne, Australia. He is the author of the commentary Romans from the Sacra Pagina series, and Paul and the Christian Woman and is a contributor to the New Jerome Bible Handbook, published by The Liturgical Press. He was Catholic Biblical Association Visiting Professor at the Pontifical Biblical Institute, Rome, and has also taught in Africa and East Asia. Pope John Paul II named him a member of the Pontifical Biblical Commission in 1990.